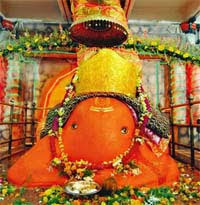 Tekdi Ganapati Yatra is observed in the famous Tekdi Ganesh Temple in Nagpur. Tekdi Ganapati Yatra 2020 date is January 13. It is observed on the Sankashti Chaturthi day in the Paush month as per traditional Marathi lunar calendar followed in Maharashtra. Another important festival here is observed during Ganesh Chaturthi in Bhadrapad month. The murti of Lord Ganesh worshipped here is Swayambhu – one that occurred naturally. The temple is called Tekdi as the mandir is constructed atop a mountain and in Marathi language Tekdi means hill. The Tekdi Ganapati Temple is located near the Nagpur Railway Station.